ECM has had many recent releases that capture many different global music types, among them the fantastic Tord Gustavsen “What Was Said”, Stephan Micus’ most recent “Nomad Songs” and “Birdwatching” from Anat Fort with Gianlugi Trovesi. 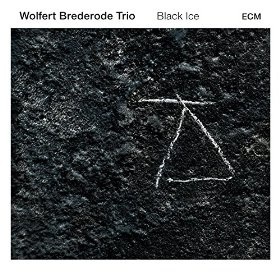 The multi dimensional approach is once again present on two releases, from Dutch pianist Wolfert Brederode’s “Black Ice”, and the Naqsh duo made up of guitarist Golfam Khayam, and clarinetist Mona Matbou Riahi. While musically each album comes from a very different zone, they share unity in the singularity of blurring composition and improvisation, the warm rich sound of RSI Studio Lugano, and interplay bordering on telepathic. Brederode’s previous two releases, “Post Scriptum” (ECM, 2011) and his debut “Currents” (ECM, 2008) found the pianist, born and bred in the Netherlands mining quartet territory. He wished to return to a classic piano trio format, and formed a group with long time bass collaborator Gulli Gudmundsson, and drummer Jesper van Hulten. The results are lyrical, and the interaction between the trio is nothing less than superb. Gudmundsson and Brederode played in a variety of situations over the years, and they fit hand in glove with van Hulten’s always appropriate, subtle, intuitive percussion work. Brederode’s lilting, beautiful “Elegia” has a melody building to a swelling crescendo courtesy of van Hulten’s delicate cymbal rolls, high hat splashes, and rustling sticks on rims, putting the listener in mind of a cool fall wind blowing leaves on the ground. The grooving, slightly funky “Olive Tree” benefits greatly from the tasty work on cymbals moving along Brederode’s always interesting improvisation. Gudmundsson shines on the gorgeous left hand piano bass unisons of “Bemani” and his lyrical singing bass on ”Rewind” shares a kinship with the way the great Ben Williams frames improvisational ideas with their detailed attention to melody. Gudmundsson’s gently churning ostinato and van Hulten’s interjections add a bit of tension to the title track, and all three musicians are adept at creating a delirious jet lagged mood on “Terminal”. All thirteen compositions are engaging and the terrific music is spellbinding on each spin.